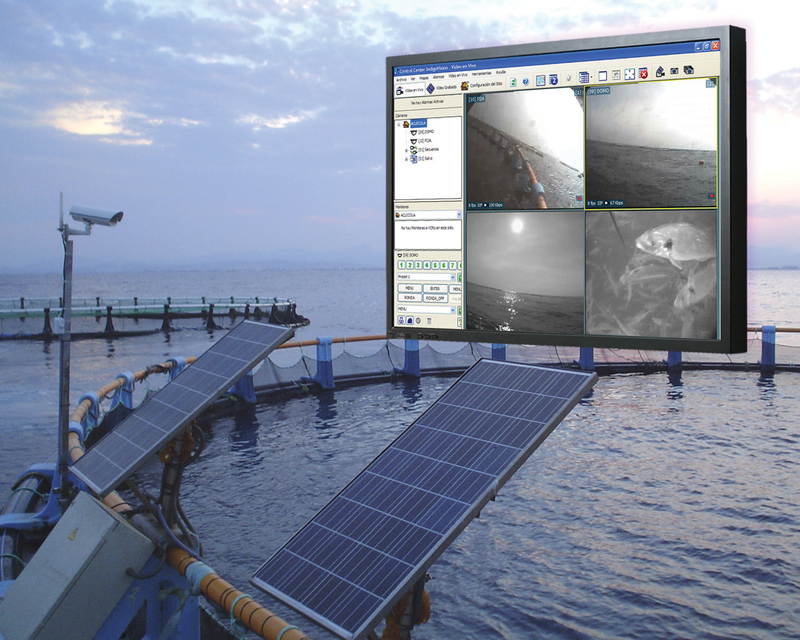 IP video technology is providing both security and operational benefits for an offshore fish farm. Acuicola Marina is one of the leading producers of farmed fish in the <?xml:namespace prefix = st1 ns = "urn:schemas-microsoft-com:office:smarttags" />Spanish Province of Castellon on the Mediterranean coast. Their offices and warehouse are located at Burriana, 3 km inland, with the fish farm facilities sited 10 km offshore. The valuable fish stock is a target for poachers and Acuicola Marina has always found it difficult to police the offshore facilities. Offshore patrols were partly successful but proved too costly and so it was decided that a CCTV monitoring system was required. This would provide the necessary security as well as a number of other monitoring functions that could benefit the business, for example submersible cameras monitoring fish growth. IndigoVision’s complete end-to-end IP video system was chosen to provide the real time video and alarm management facilities required of the system. The overall solution was designed and installed by IndigoVision’s local approved integrator, Ralco Networks. The system is managed by IndigoVision’s ‘Control Center’ software and recording is achieved using IndigoVision’s Networked Video Recorders (NVRs), which are installed on the network at the on-shore offices. Several operators use ‘Control Center’ workstations to view both live and recorded video from any of the offshore cameras. ‘Control Center’ provides advanced search and video analysis tools that the operators use to identify security breaches and to monitor fish growth which helps determine the correct distribution of food. ‘Control Center’ also handles alarm and event data such as equipment malfunctions and power system monitoring, all of which is transmitted over the network.